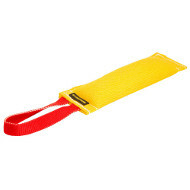 in our online shop, you can order equipment for daily walks, training, dog shows, etc. Today you will also receive a 10% discount for the second product in this category! Use it with coupon code 7757! 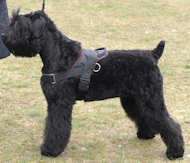 The Russian Black Terrier is the dog race originating from the former USSR, the result of crossing of 17 races of dogs. His body - large, robust and very strong - is built for serious actions. 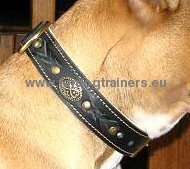 The pronounced head of the Terrier consists 40 % of the weight of his body, covered with double coat always black. 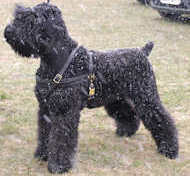 The Black Russian Terrier (BRD) is a powerful working dog and an excellent guard dog. This great dog needs space to move. 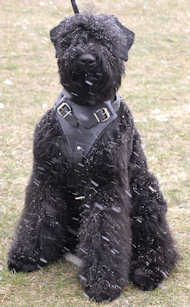 The Black Russian Terrier is balanced, strong, enduring, intelligent and friendly. 1. 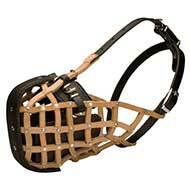 I have a mobility dog, it is for him that I ordered this fantastic harness. Craftsmanship and look are just excellent. Your staff is really qualified, ready to help you to make the right choice and give needed assistance.